This fascinating book explains all you ever wanted to know about the versatile pear-shaped green fruit with its buttery-yellow flesh. The author, Eric Bolsmann, has again delved deeply into the archives. As a result the origin of the avocado in Central and South America and its introduction to and development in South Africa is related in an easy-to-read manner. Nutritional values are given and hints on the buying, storage and preparation of avocados are explained. The recipes range from starters to dessert and drinks. Avocados for Africa is, like its companion, Mushroom Magic, is a South African cookery classic in its own right. 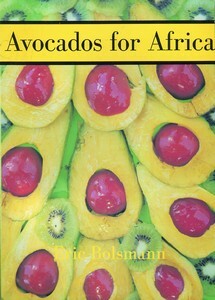 Avocados for Africa was published by Be My Guest Publishers in?Pretoria as a 124-page soft-cover edition in 1993. The book is presently out of print.